Sarah, of Sarah and the Goon Squad has a funny post up with a photo of plasticware that claims to be "extra clear." It got me thinking about stupid copy you find on products in your home. Like the John Freida "Brilliant Brunette" hair conditioner I use. It smells almost exactly like Raid Ant Spray, but it seems to work ok. The tube claims it has Light EnhancersSM in it. Um, I'm no Einstein, so you will have to explain how one enhances light? Mr. Spock? Dr. Feynmann? Anyone? I also used to have shampoo that would help my hair when it was "Stressed." Ooh, poor stressed hair. Did you have a rough day? Do you have any product copywriting stupidness around your home? Hit me with it. ...at this hour, the Reverend Doctor Martin Luther King, Jr. was assassinated. We want to think that, if we are good people, good things will happen to us, that somehow God will reward our goodness. Wrong. Look at Jesus, look at Martin. Do good things and people will most certainly despise you and you may be cut down in the prime of your life, slain in the most horrible way. The lesson of the assassinations of Jesus and Dr. King is the same: the killing did not matter. Just because their bodies were stopped doesn't mean they stopped. They knew they were greater than death, as we all can be if only we have the heart, the courage. The influence of the truly righteous continues after they die and it keeps getting stronger because goodness and truth are contagious. This is a sad and hurting world and it needs all of us to work to make it better. We are a team and if we don't all help each other, no one wins. I try to remember that everyone I meet is on my team. The mother struggling with the stroller and a heavy door is my teammate. The sad cashier at the grocery store is playing, too. The angry neighbor, the rookie cop - I may not like them, but these are the people who have showed up to the game today, and I have to make adjustments to accommodate them. When I help them, we score. If I refuse to help them, no one scores. I don't have a big dream like Dr. King. I just want to be welcoming and to be kind and then to take it from there. I figure that is a good place to start. To post SOMETHING to get McCain off the top of my blog, but I don't have anything to say. I have been eagerly following the adventures of our friends at J&J Baby Camp on Twitter. I have never said this before, but I sort of wish I was in New Jersey! You can get your cool buttons for Bloggers for McCain here. Bossy is tooling around the country in a free Saturn Aura. 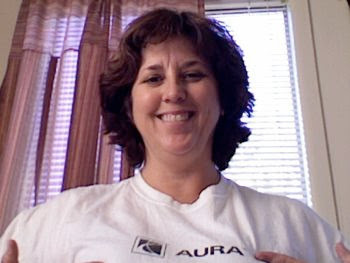 Suebob is wearing a free Saturn Aura t-shirt (from BlogHer '06 - this is its first wearing) while using tools (like the vacuum and mop). Is mopping the floor in a Saturn Aura t-shirt as much fun as going on a nationwide blogging tour? I'll never tell. (No, I am not baked. It is the camera angle, I swear).